Who knew that potatoes could be such fun? 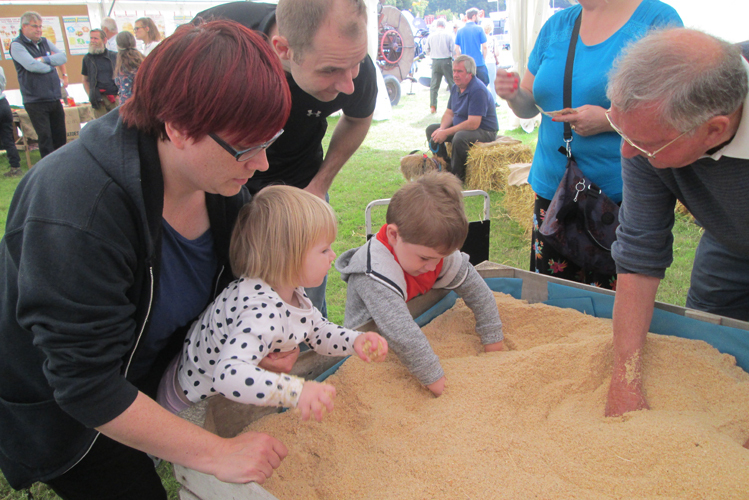 Children, mums, dads, uncles and aunts flocked to the Slow Food pitch at the Aylsham Show to scrabble about in a tub of sawdust – hunting for potatoes. Or stones, as it turned out. 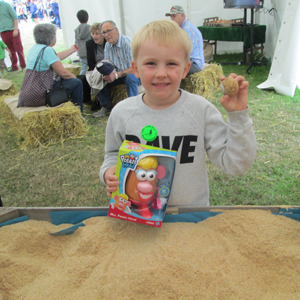 The Slow Food lucky dip tub promised the finder of the “golden snail” a Mr or Mrs Potato Head toy. But even if you couldn’t find the “treasure” you were a winner anyway – a bag of Kettle’s crisps for a potato, a bag of sweets for a stone. One of the two winners was Bertie Bowes, of Briston (right). 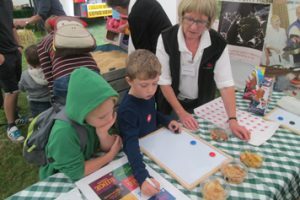 Potatoes were the theme of this year’s Discovery Zone in the food and farming marquee and Slow Food set its stall around a banner display of the history of the edible tuber, the lucky dip tub, a quiz, flavour taste test, and the ever-popular cookery demonstrations. 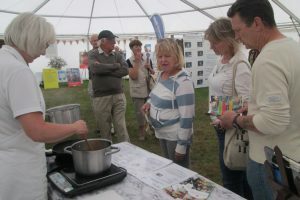 Presented by Jill Willis, the four cookery demonstrations showed how to cook spuds four ways: patatas bravas, potato pancakes, a potato coconut curry, and a delicious soup from the peelings. 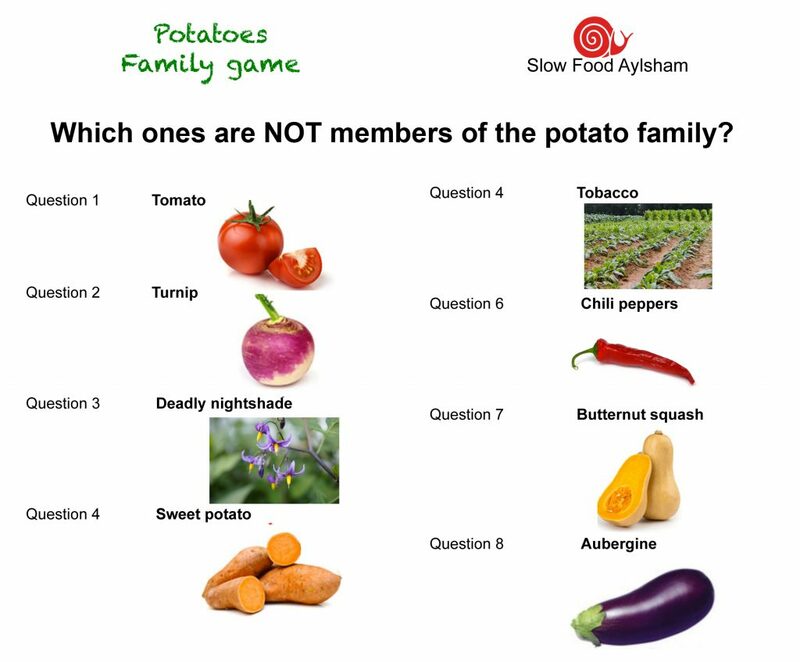 Between courses, visitors to the stand were asked to identify which vegetable/fruit is not a member of the potato family. 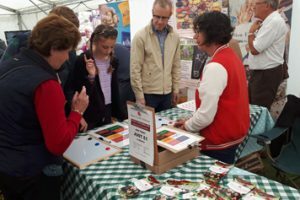 The prize – a family ticket for the Aylsham Food Festival Big Slow Brunch on Sunday 7 October (details to follow). Play the quiz below and test your knowledge. Then there was the crisp flavour test (right). Would you be able to tell the difference between sea salt and balsamic vinegar, crispy bacon, and Cheddar and onion? It’s harder than you think.These youngsters got two out of three. And can you guess what the prizes were? 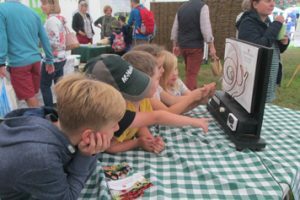 Meanwhile, across the way, the snail buzzer game – also non-digital – attracted curious youngsters who were determined to get round the tricky loops of the Slow Food snail without touching the piping. Shocks all round – there was definitely a buzz around this table. 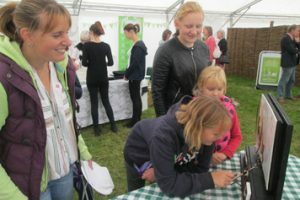 Late summer, balmy weather and more than 15,000 people wandering round the Aylsham Show at the Blickling estate on August Bank Holiday – surprisingly, perhaps, many people were happy to discover more than they thought they wanted to know about potatoes. 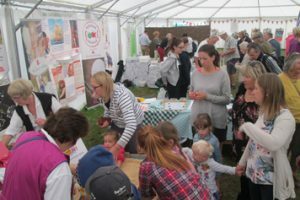 Some kind words from our Aylsham Show (Food and Farming Area) friends.